Understanding network security can be complicated, but ensuring that your network is secure from malicious threats shouldn’t be. Dell™ SonicWALL™ Comprehensive Security Suite (CGSS) removes the complexity associated with choosing a host of add-on security services by integrating all the network security service required for total protection into a convenient, affordable package. 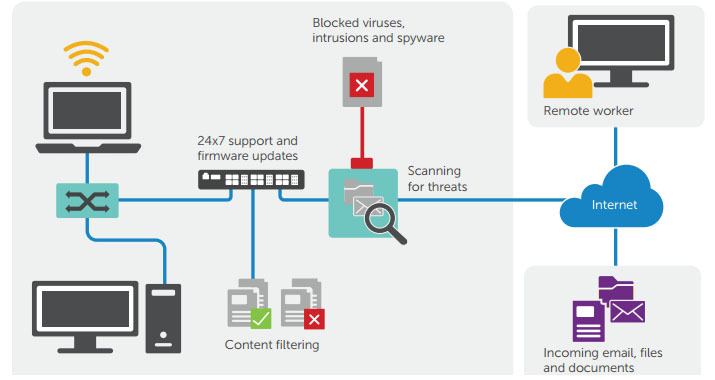 Dell SonicWALL CGSS keeps your network safe from viruses, intrusions, botnets, spyware, Trojans, worms and other malicious attacks. As soon as new threats are identified, and often before software vendors can patch their software, Dell SonicWALL firewalls and Cloud AV databases are automatically updated with signatures that protect against these threats. Inside every Dell SonicWALL firewall is a patented Reassembly-Free Deep Packet Inspection® engine that scans traffic against multiple application types and protocols, ensuring your network has around-the-clock protection from internal and external attacks and application vulnerabilities. Your Dell SonicWALL solution also provides the tools to enforce Internet use policies and control internal access to inappropriate, unproductive and potentially illegal web content with comprehensive content filtering. Finally, this powerful services bundle also includes around-the-clock technical support, crucial firmware updates and hardware replacement. that integrates everything you need for comprehensive protection from threats such as viruses, spyware, worms, Trojans, adware, keyloggers, malicious mobile code (MMC) and other dangerous applications and web content. ICSA-certified gateway anti-virus and anti-spyware protection combines network-based anti-malware with a cloud database of over 12 million malware signatures for deep security protection against advanced, modern threats. Application intelligence and control is a set of granular, application-specific policies providing application classification and policy enforcement to help administrators control and manage both business and non-business related applications. 24×7 support with firmware updates and hardware replacement protects your business and your Dell SonicWALL investment through crucial firmware updates and upgrades, the finest technical support, timely hardware replacement and access to electronic self-help tools.